PHILADELPHIA (WPVI) -- The admiration for Roy Halladay is bringing Phillies fans together 3,539 miles away from where he played in Philadelphia. 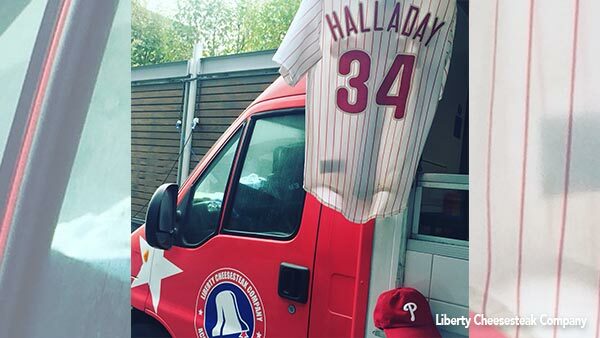 A Halladay Phillies jersey hangs in front of the Liberty Cheesesteak Company's truck at the Old Spitalfields Market in London. "We had several customers mention how sad they were and they thanked us for hanging his jersey off the truck," Liberty Cheesesteak Company founder JP Teti told Action News Wednesday. Teti grew up in South Philadelphia - 9th and Dickinson to be exact - with his family that emigrated from Italy in 1904. Teti says Philly food and sports have been a big part of his life since the beginning. He moved to London in 2008 for a corporate job, but his passion for food and Philadelphia sports never left. Remembering Roy Halladay: Katherine Scott reports during Action News at Noon on November 8, 2017. "His coming to Philadelphia was one of the key data points that demonstrated that the underachieving team and organization I grew up supporting had finally become the first class firm we always hoped it could be. It was really a wonderful time for Phillies baseball," Teti said. Three years ago, Teti left his corporate position and founded the Liberty Cheesesteak Company to bring a taste of Philadelphia to the streets of London. On his menu, he brought staples like the Philly Cheesesteak and WIZ Fries to entice the fish and chips crowd. But starting on day one, the food was not the only slice of Philly Teti included in his new venture. Another - Phillies jerseys, specifically Roy Halladay's. "All of our staff wear Phillies jersey as our uniform and Roy's were the first ones I bought when I started the company, so it's almost like Roy has been with us on this journey from the beginning and we've been channeling his grit in our efforts to achieve the goals we set for the business," Teti said. When the news broke that Halladay passed away in a plane crash, Teti decided to place one of those jerseys out in front of his food truck that sits in the historic Spitalfields Market on the East End. Many visitors have passed by the jersey to express their sorrow. "Hanging his jersey out in front of the truck this morning was a bit therapeutic. I find it's better to grieve in groups, so it's been really nice to have people, who share our grief, stop by today and just chat about how lucky we've been to experience Roy Halladay," Teti said. One of those people who stopped by was Action News viewer and Havertown-native Randi Milgram and her husband. Both are graduates of Penn Law and now live and work in London. They are frequent customers to the Liberty Cheesesteak Company. "The cart is outside my husband's work and so he eats there a lot. They're the best outside Philly because the owners are really from Philly," Milgram said. Even though Milgram is a vegan, she says she doesn't miss an opportunity to visit the truck. "They have trash cans with the LOVE symbol and the staff wears Phillies hats and jerseys. I'm vegan, but I still love them because I get to see a real piece of home all the time," Milgram said. So when they saw Halladay's jersey hanging, they had to stop and take a photo. "Philly love extends all the way to London," Milgram tweeted. Milgram recalled what it meant for her brother to be able to see Halladay's postseason no-hitter in 2010 in person. "My brother was sitting in our seats behind the dugout. He always said it would be one of the best sports experiences of his life," Milgram said. Milgram says like everyone who follows baseball or is from Philadelphia is devastated over the loss of the man known as Doc. She told Action News, "Roy, as amazing as he was at baseball, he seemed to be an even better person and that makes this terrible tragedy even sadder; when the world loses a decent person we all need to try to fill the void left by being kinder and more empathetic to others." As the Halladay jersey miles away from Citizens Bank Park sways in the London air off Teti's food truck and makes those who walk by reflect, he thinks about the family the ace pitcher leaves behind. "As a father of two small children, I can't stop thinking about his wife and children. I hope they feel some of the love we all share for their dad/husband and in some way that helps them to cope with his no longer being with them," Teti said. Teti says it's been a tough year for Phillies fan, losing both beloved catcher Darren Daulton and Halladay. "But the pain we feel in their loss, must be commensurate to the joy they gave so many in their lives. If that's the trade off, then I'll take it every time," Teti said. Teti plans on continuing to spread the Philadelphia brand across the UK by opening a Philly-themed bar in Central London in January.